In 2009, I read about the Jesse tree, a kind of Advent calendar that traces the lineage of Jesus the whole way through the Old Testament, back to God Himself. Even though we hadn't spent much time in church, I wanted to focus our family's Christmas holiday on Jesus. I wanted time to reflect on Him and pray, and I wanted to share Him with Grace. I made gorgeous felt ornaments for our tree. I collected readings and prayers from books, websites, and friends. I put together a spiral bound flip book of devotionals that first year. The flip book didn't work the second year because I had used the dates, and the dates change each year. I had to start over completely. The second year, I put the devotionals on a stack of index cards held together by a binder ring. That worked, but there wasn't enough room on the cards for the extra information I needed, like the words for some of the songs and the text of the important Bible verses. 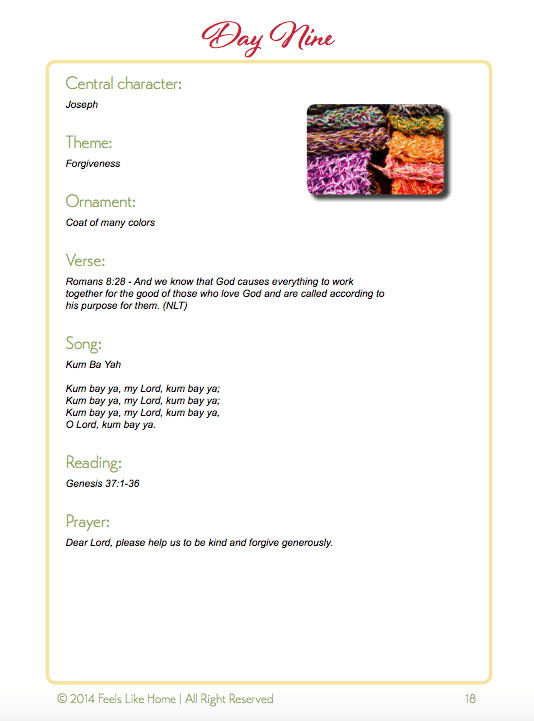 Best of all, at the request of my Bible study friends, I made the devotions into an eBook, a file that I could share with other families to help them create their own Jesse trees. The ebook includes all 28 possible days of Advent, plus full-color printable ornaments you can cut out and paste or hang on a paper tree. In the spirit of the holiday, it's completely free. While you're here, I would be delighted if you would Like Feels Like Home on Facebook and follow me on Pinterest and Instagram. Celebrate advent. Grow closer to Jesus. You are very welcome. I hope you enjoy the Jesse Tree.